Morocco’s second spy satellite, named Mohammed VI-B for the nation’s king, rode the Vega launcher to orbit a little more than a year after an identical reconnaissance craft lifted off on a prior Vega flight. The 98-foot-tall (30-meter) rocket lit its solid-fueled first stage and lifted off from the Guiana Space Center at 8:42:31 p.m. EST Tuesday (0142:31 GMT Wednesday), rapidly soaring into a starry sky heading toward the north from the South American coastline. Following the same timeline and trajectory as last year’s launch of the Mohammed VI-A satellite, the Vega rocket shed its Italian-built three solid-fueled booster stages in the first six-and-a-half minutes of the mission. Flying over the Atlantic Ocean, Canada, and the Arctic, before heading south toward Australia, the Vega’s liquid-fueled upper stage ignited its Ukrainian-made engine twice to position the Mohammed VI-B satellite in a near-circular orbit with an average altitude around 375 miles (604 kilometers) above Earth. Telemetry radioed back to launch controllers in French Guiana through a ground station in Western Australia confirmed the separation of the 2,442-pound (1,108-kilogram) Mohammed VI-B spacecraft from the Vega launcher approximately 55 minutes after liftoff. 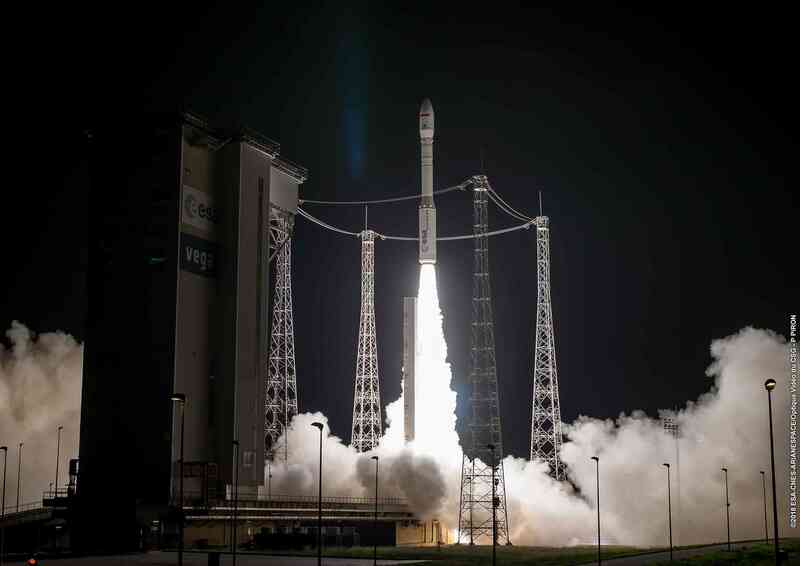 Officials with Arianespace, the Vega rocket’s commercial operator and sales firm, and the Vega’s Italian-headquartered manufacturer Avio declared success on Tuesday night’s mission, making the light-class launcher 13-for-13 since its debut in 2012. The Vega rocket is the smallest of Arianespace’s rocket family, alongside the medium-lift Soyuz launcher and heavy-duty Ariane 5. Next year could be the busiest year yet for Vega launch operations, with the next Vega flight slated for early 2019 carrying Italy’s PRISMA Earth observation satellite. In mid-2019, a Vega rocket is scheduled to haul dozens of smallsats to orbit on the first commercial rideshare mission launched by Arianespace. Spain’s Ingenio Earth observation satellite is also expected to launch in late 2019 aboard a Vega rocket, and the upgraded Vega-C launcher is set to debut in a launch from French Guiana by the end of next year. The Vega-C upgrades include bigger first stage and second stage motors to allow the rocket to carry heavier payloads to orbit. The solid-fueled first stage, named the P120, is the same rocket motor to be used as strap-on boosters for the next-generation Ariane 6 rocket, a shared component European officials say will reduce operating costs. Meanwhile, Avio is already planning another future Vega variant named the Vega-E, which could launch by 2024 with a new European upper stage propelled by a methane-fueled M10 engine. The methane stage would replace the Vega’s third stage motor and Ukrainian fourth stage engine. The M10 engine can be reignited in space, and can be throttled to adjust thrust and meet the demands of each mission. It also uses a 3D-printed thrust chamber, reducing the cost of manufacturing. Engineers test-fired a subscale version of the M10 thrust chamber in Colleferro, Italy, for the first time last week. The Mohammed VI-B spacecraft, manufactured in partnership between Thales Alenia Space and Airbus Defense and Space, will serve Morocco’s civil government agencies and military. The Mohammed VI-B satellite’s imaging capabilities are secret, but it carries an optical camera and image transmission system provided by Thales Alenia Space, which served as prime contractor for the mission under an agreement with the Moroccan government. Airbus Defense and Space provided the satellite bus, which was assembled in Toulouse, France. The Moroccan government ordered the two high-resolution Earth observation satellites — named Mohammed VI-A and VI-B — from French industry in 2013 after an intergovernmental agreement between Morocco and France. Developed in secrecy, Mohammed VI-B is the second of the two satellites to launch. The Vega rocket deployed the satellite in a sun-synchronous north-south orbit, where it will joined its predecessor Mohammmd VI-A. With two satellites, the Moroccan government can collect imagery of the same location with higher frequency. The Mohammed VI-A and VI-B satellites are the most capable optical surveillance satellites owned by any African nation. 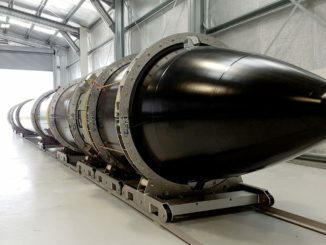 The entire program, including two satellites, launch services and ground support, reportedly cost Morocco between 500 million and 600 million euros ($568 million to $681 million). But a report published last November by the French newspaper Le Monde suggested the satellites have a strong military purpose. “We know that Morocco is at odds with Spain and Algeria regarding certain issues and that the situation is tense at the border with Mauritania. Both these satellites will give Morocco the means to gather intelligence and an independence that no one else has in the region,” said Florence Gaillard-Sborowsky, researcher at France’s Strategic Research Foundation and an expert in space issues in the Arab region, according to Le Monde. “It is true that we consider it our right to be up-to-date. 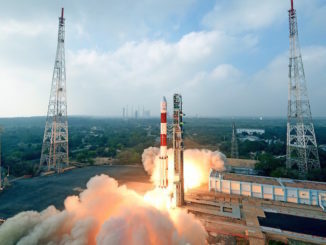 But no one should worry as we have good intentions,” said Ahmed Réda Chami, Morocco’s ambassador to the European Union, in remarks last year referring to the satellite program. Observers believe the Mohammed VI satellites are based on Airbus’ AstroSat-1000 design. An artist’s concept of Mohammed VI-A shows an outward appearance similar to France’s two Pleiades Earth observation satellites and two Falcon Eye spacecraft ordered from Airbus by the United Arab Emirates. 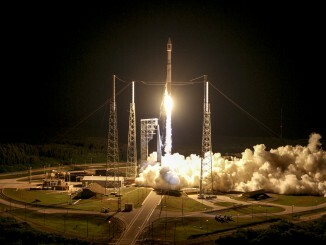 The Pleiades satellites, which provide imagery for government and commercial customers, were launched in 2011 and 2012. Each Pleiades satellite can take pictures with a resolution as sharp as 2.3 feet (70 centimeters), and post-processing can improve the image quality to 1.6 feet (50 centimeters). The Falcon Eye and Mohammed VI satellites are widely believed to have comparable capabilities. The UAE’s first Falcon Eye satellite is also booked for a Vega launch, perhaps as soon as next year.